Whether it's a simple garden wall or a wall to hold back the soil behind it, we have the means to make it happen. You don't just want a retaining wall to look good, it needs to perform well, geo grid is often used in these structures to stabilize the soil behind it which in turn eases the lateral pressure of soil. Rest assured, your project will be built by certified professionals so your wall will last. As you can see, the options are endless and so are the construction techniques. Some walls will need an engineer to sign off on it while smaller decorative walls will not, either way, you want it to last and we ensure that. More sophisticated walls use what is called Geogrid, its primary purpose is to stabilize the soil behind it to relieve the hydrostatic forces that are acting against it. If you are needing a wall to hold back a large volume of soil, ensure it is constructed properly, we will engage with the manufacturers and engineers to ensure it is correctly built. 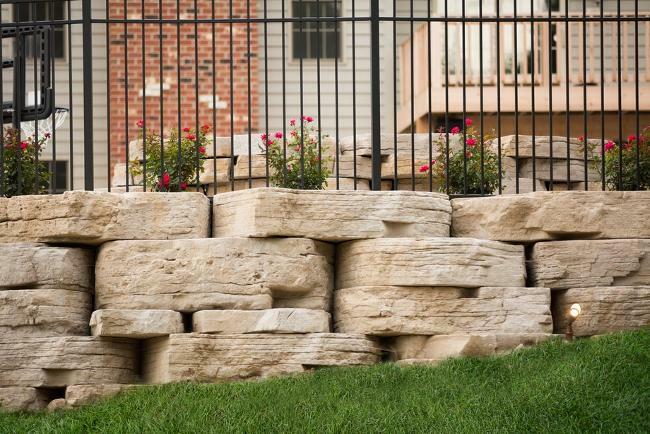 We have many options to choose from but one of the most popular is the Outcropping wall, a Rosetta line of wall blocks by Browns Concrete. This wall was featured on Holmes and Holmes, Mike Holmes was a big fan of this look and why not? this wall is functional and looks fantastic.